Our solution experts will get in touch. See in just a few minutes how Perengo DSP can help you scale your workforce. The Perengo DSP demo will show you how industry-leading recruiters use the platform to automate and optimize their recruitment process. Campaign Creation: The platform saves hours of your time when setting up campaigns. 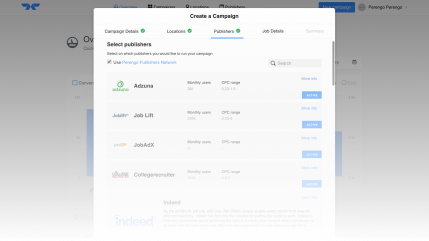 Automated Job Distribution: Your job ads are automatically distributed across your trusted job board partners and the Perengo network. Goal Setting: The platform optimizes towards your goals (volume; budget; etc.). Campaign Analytics: See actionable data in a unified dashboard. Perengo has been helping industry leaders scale their workforce.